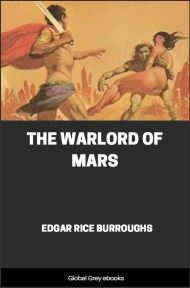 The Warlord of Mars is a science fantasy novel written by Edgar Rice Burroughs, the third of his famous Barsoom series. 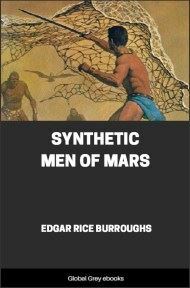 This novel continues where the previous one in the series, The Gods of Mars abruptly ended. 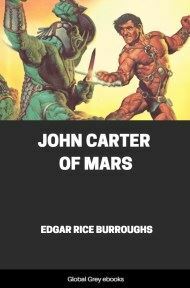 At the end of the previous book, John Carter's wife, the princess Dejah Thoris, is imprisoned in the Temple of the Sun by the vile pretender goddess Issus. In the shadows of the forest that flanks the crimson plain by the side of the Lost Sea of Korus in the Valley Dor, beneath the hurtling moons of Mars, speeding their meteoric way close above the bosom of the dying planet, I crept stealthily along the trail of a shadowy form that hugged the darker places with a persistency that proclaimed the sinister nature of its errand. For six long Martian months I had haunted the vicinity of the hateful Temple of the Sun, within whose slow-revolving shaft, far beneath the surface of Mars, my princess lay entombed—but whether alive or dead I knew not. Had Phaidor's slim blade found that beloved heart? Time only would reveal the truth. 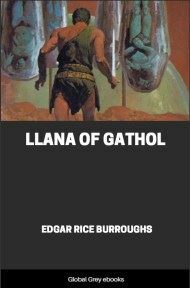 Six hundred and eighty-seven Martian days must come and go before the cell's door would again come opposite the tunnel's end where last I had seen my ever-beautiful Dejah Thoris. 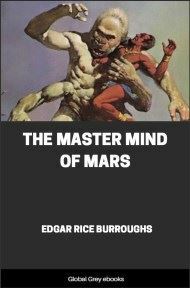 Half of them had passed, or would on the morrow, yet vivid in my memory, obliterating every event that had come before or after, there remained the last scene before the gust of smoke blinded my eyes and the narrow slit that had given me sight of the interior of her cell closed between me and the Princess of Helium for a long Martian year. As if it were yesterday, I still saw the beautiful face of Phaidor, daughter of Matai Shang, distorted with jealous rage and hatred as she sprang forward with raised dagger upon the woman I loved. I saw the red girl, Thuvia of Ptarth, leap forward to prevent the hideous deed. The smoke from the burning temple had come then to blot out the tragedy, but in my ears rang the single shriek as the knife fell. Then silence, and when the smoke had cleared, the revolving temple had shut off all sight or sound from the chamber in which the three beautiful women were imprisoned. 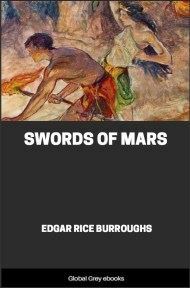 The race of blacks that for ages had worshiped Issus, the false deity of Mars, had been left in a state of chaos by my revealment of her as naught more than a wicked old woman. In their rage they had torn her to pieces. From the high pinnacle of their egotism the First Born had been plunged to the depths of humiliation. Their deity was gone, and with her the whole false fabric of their religion. Their vaunted navy had fallen in defeat before the superior ships and fighting men of the red men of Helium. Fierce green warriors from the ocher sea bottoms of outer Mars had ridden their wild thoats across the sacred gardens of the Temple of Issus, and Tars Tarkas, Jeddak of Thark, fiercest of them all, had sat upon the throne of Issus and ruled the First Born while the allies were deciding the conquered nation's fate. 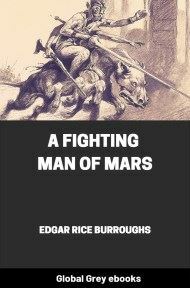 Almost unanimous was the request that I ascend the ancient throne of the black men, even the First Born themselves concurring in it; but I would have none of it. My heart could never be with the race that had heaped indignities upon my princess and my son. At my suggestion Xodar became Jeddak of the First Born. He had been a dator, or prince, until Issus had degraded him, so that his fitness for the high office bestowed was unquestioned. The peace of the Valley Dor thus assured, the green warriors dispersed to their desolate sea bottoms, while we of Helium returned to our own country. Here again was a throne offered me, since no word had been received from the missing Jeddak of Helium, Tardos Mors, grandfather of Dejah Thoris, or his son, Mors Kajak, Jed of Helium, her father. Over a year had elapsed since they had set out to explore the northern hemisphere in search of Carthoris, and at last their disheartened people had accepted as truth the vague rumors of their death that had filtered in from the frozen region of the pole. Once again I refused a throne, for I would not believe that the mighty Tardos Mors, or his no less redoubtable son, was dead. "Let one of their own blood rule you until they return," I said to the assembled nobles of Helium, as I addressed them from the Pedestal of Truth beside the Throne of Righteousness in the Temple of Reward, from the very spot where I had stood a year before when Zat Arras pronounced the sentence of death upon me. As I spoke I stepped forward and laid my hand upon the shoulder of Carthoris where he stood in the front rank of the circle of nobles about me. As one, the nobles and the people lifted their voices in a long cheer of approbation. Ten thousand swords sprang on high from as many scabbards, and the glorious fighting men of ancient Helium hailed Carthoris Jeddak of Helium.